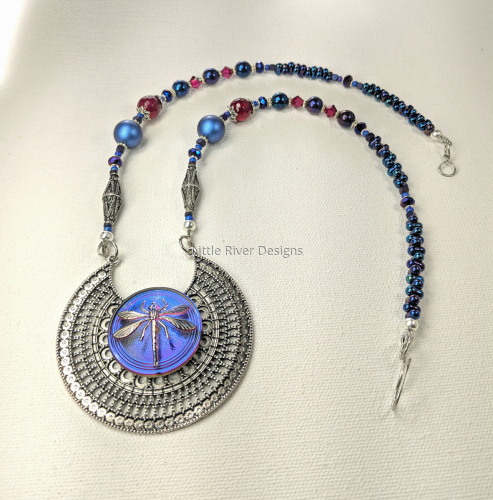 Glass dragonfly hovers in the center of a silver plated medallion with every movement flicks of blue, violet and pink shimmer from this pendant. 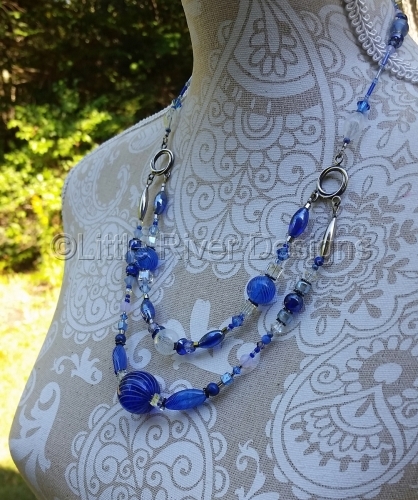 Accented in sterling silver, blue iris and pink agate. 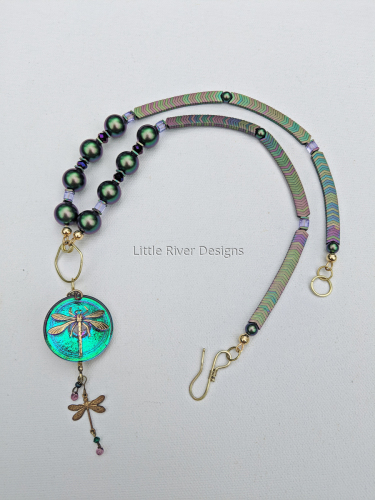 A dragonfly charm dangles from a glass pendant with Swarovski pearls and hematite chevron that give this necklace a serpentine quality. 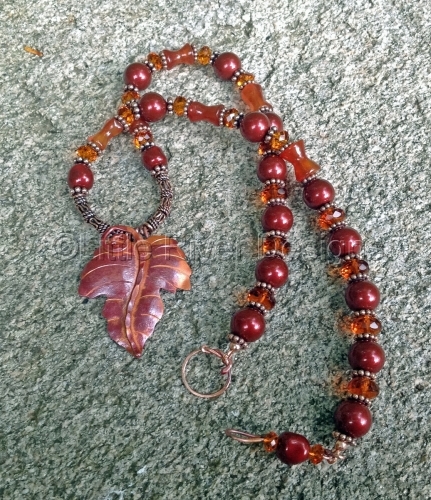 Handmade copper maple leaves are the focal point of these pieces accented by autumn hues of deep burgundy Swarovski pearls and crisp orange carnelian and golds. Great addition for your fall wardrobe. 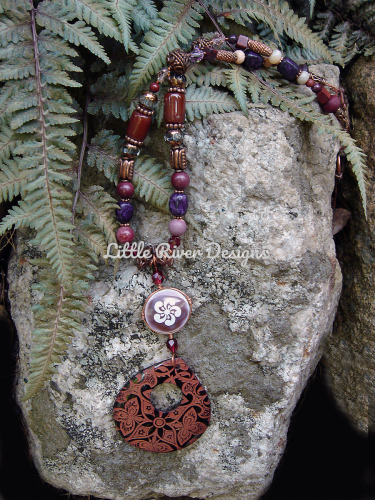 A copper dyed tab shell pendant dangles below etched wire wrapped horn on a 22 inch beaded necklace of Amethyst, Garnet, Moukaite and copper hand picked for their shades of maroon, pinks and purple. 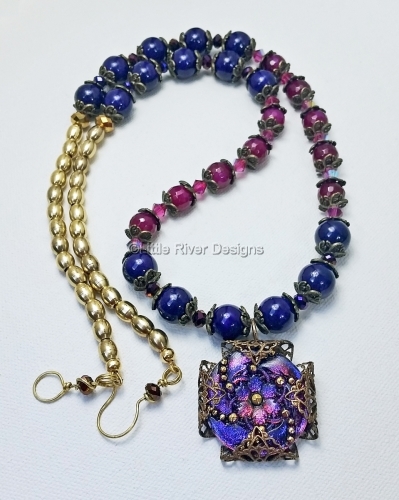 Thirty two inch long pink agate and purple river stone necklace starts with a Czech glass daisy pendant in violet and pink with gold embellishments. 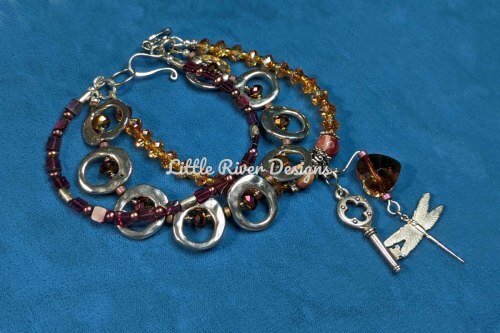 It finishes in solid brass metal beads and a handmade clasp. Sits below bust line. This is a six strand mother of pearl, cherry quartz, apatite and red coral necklace with sterling silver accents. Colorful in teals, pinks and reds it will make a beautiful summer addition to your wardrobe. Earrings made of surgical steel never to tarnish. 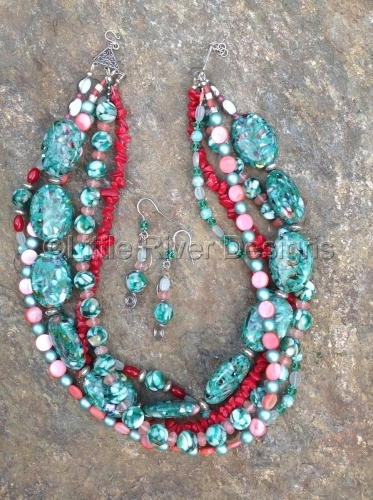 Double tiered necklace of Italian blown glass beads and sterling silver matched with Swarovski crystals. 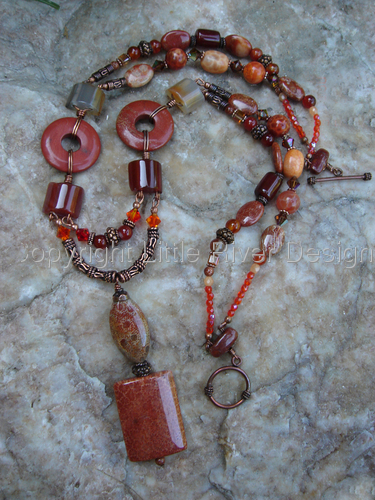 Goddess pendant and amber beads imported from Tibet are complimented by red cinnabar, golden mother of pearl, turquoise magnesite and hammered brass. 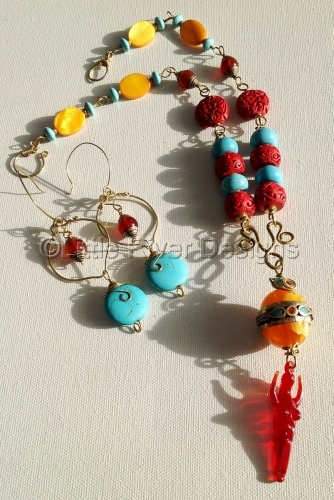 Tibetan and magnesite beads also dangle from brass earrings that complete this colorful set. 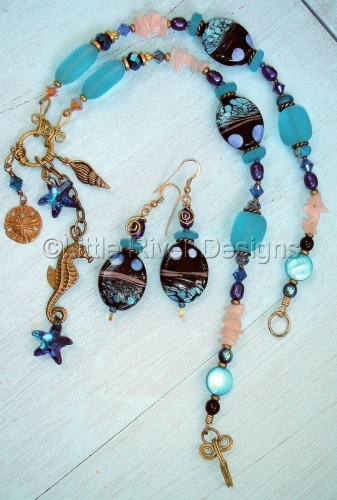 Seahorse and starfish charms dangle from this cute summer necklace created with lampwork glass beads and seaglass in colors inspired by the sea. Earrings to match included. 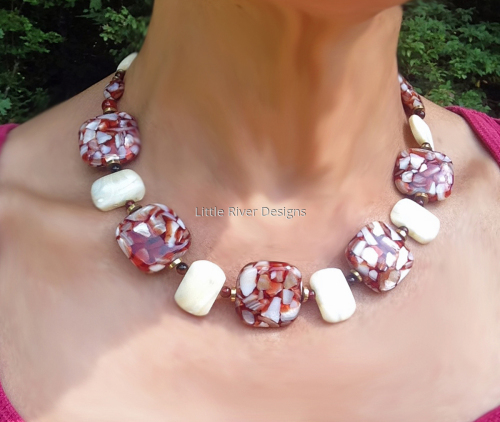 Mother of Pearl mated with seashell, carnelian and brass to create this colorful choker style necklace. Earrings of seashell and mother of pearl. My tribute to my favorite season this is a 22 inch double strand necklace of Fire Agate, Garnet, Moukaite, Carnelian and Red Jasper. A mix of copper wire wrap and beading with a 2 and one half inch Fossil Coral pendant.